Bubba finished his work in Colorado and was able to move home this last weekend. (Yes, I'm SO excited! Yes, it was 3 very long months! And yes, I'll fill you in on the deets very soon.) One of the things I've missed these last 3 months? Having friends over. 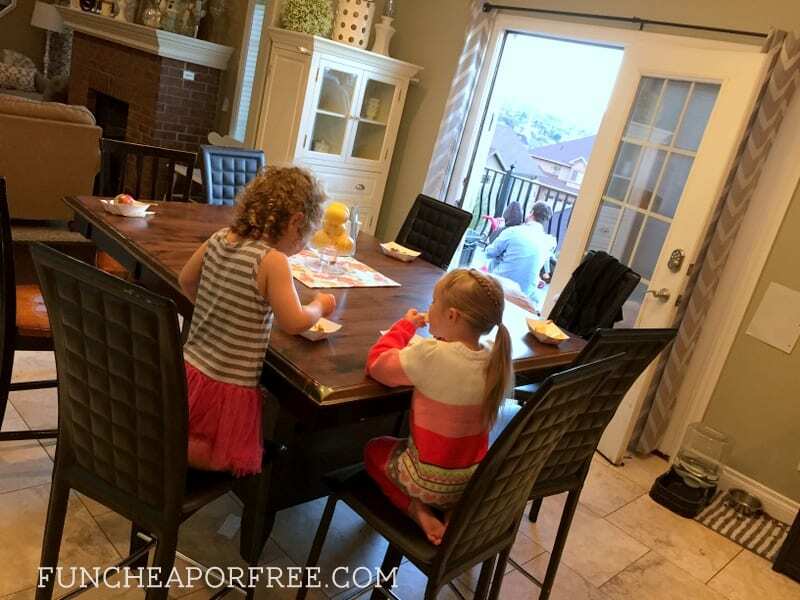 I've hosted some mom activities (as explained HERE) but I was excited to have some couples over. We made a last-minute decision to host couples for dessert the next day (Sunday). We wanted whatever we did to be casual, quick and easy, delicious (duh), and inexpensive (meaning, things we already had lying around). We chose two couples that we want to get to know better, and we felt would enjoy getting to know each other better too. It sure helps that all our kids are roughly the same ages, and they live in our same neighborhood. I sent each of them a text the night before. Told you it was last-minute! If you can give a few days' notice, that tends to work better – but last minute worked out fine in this case. (Yes, my invites are casual. And yes, this step might seem like a no-brainer – but I'm sharing every step of the way, in case it inspires someone out there by showing that you do NOT have to do fancy things to have a great time and make friends!). Each couple asked what they could bring so I asked them to bring apples or creative apple toppings. I'm always a big fan of letting people contribute, especially if they offer! The next day we went to church and ate dinner as a family as usual. 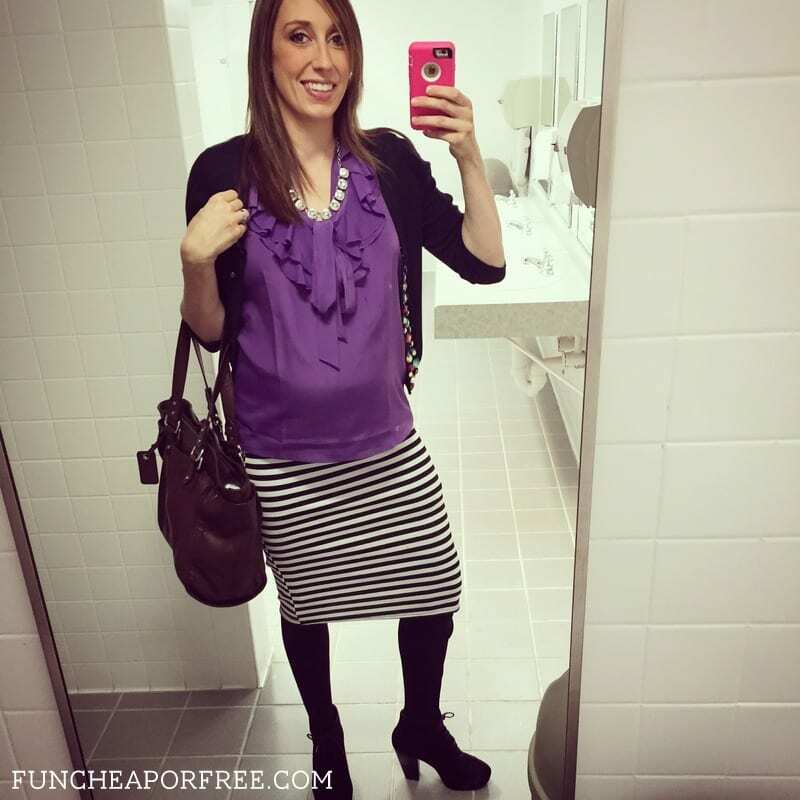 Just for kicks, here's the outfit I wore to church. Certainly put me in the Halloween spirit. I cleaned my house while the kids were napping (using a timer to blitz clean the messy rooms). 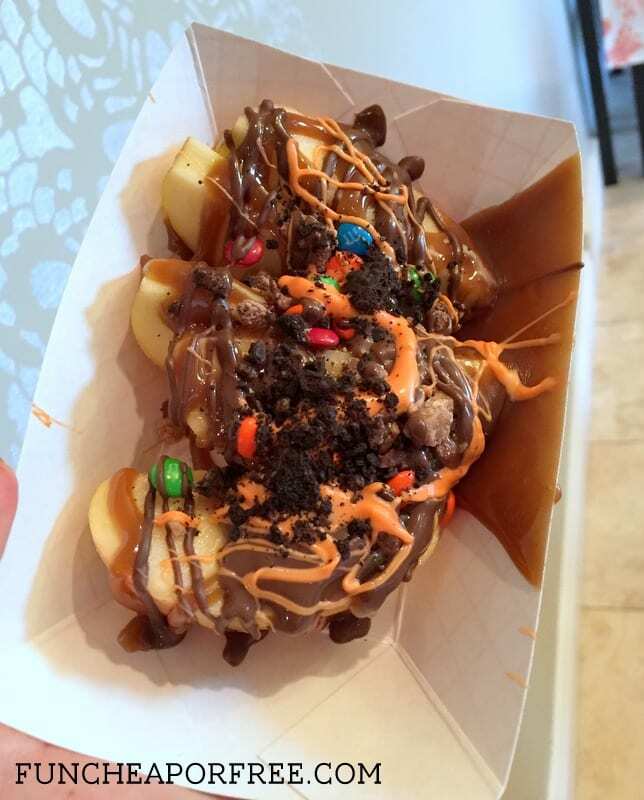 Next, I dug through my pantry and laid out creative toppings in ice cream dishes. 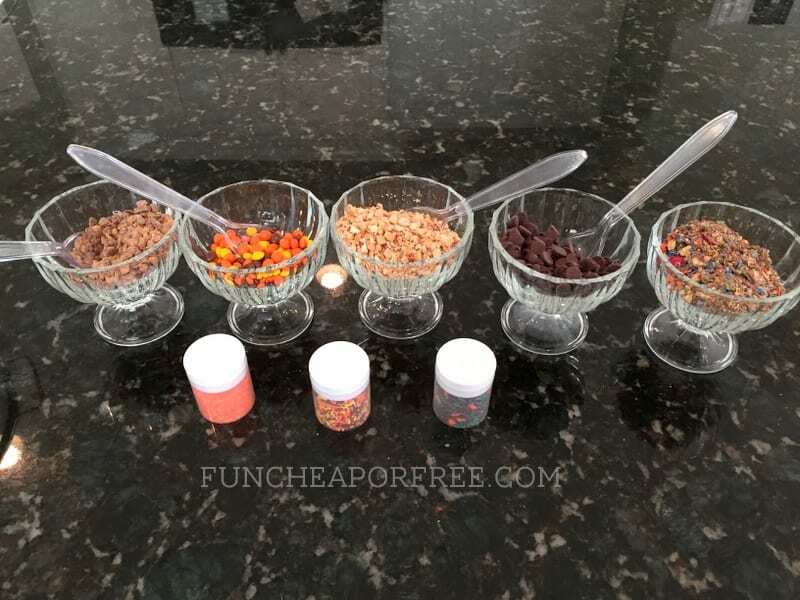 I used a small food chopper to chop the candy and nuts. 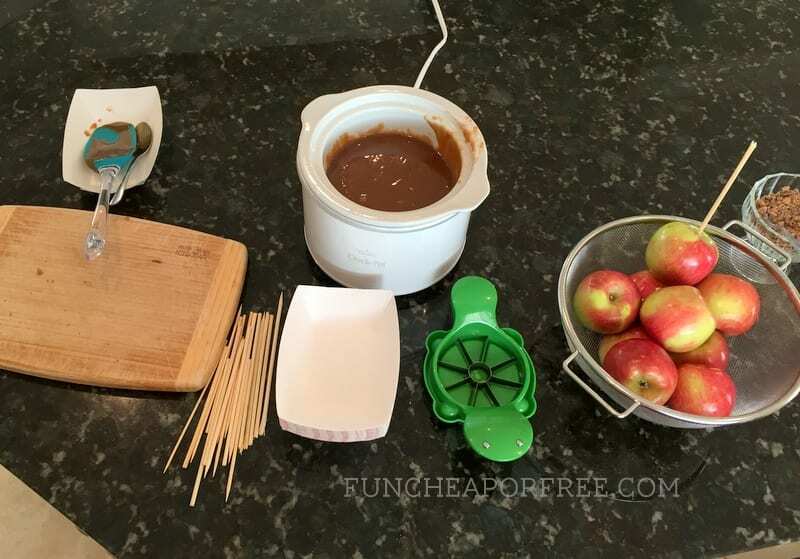 Melted dipping chocolate (perfect for drizzling) – I even had some orange melting chips in my freezer from last year that we used, perfect for Halloween. Next, I washed the apples, laid out the utensils, cups, & plates (I love the hot dog trays from Costco like THESE , as I show at Hutch's party HERE). I broke wooden kabob sticks in half to use for the apples. For the caramel, I made my amazing homemade caramel recipe (that I can take no credit for because I got the recipe from Bubba's mom). I made it on the stove about 50-60 minutes before company came, then put it in a small crockpot on low about 15-20 minutes before they came to keep it warm and runny. It was easy, fun, and so so so so so delish. A few people chose to dip their apples in full then cut it into slices with a knife. The rest of us (including the kids) used an apple slicer (best invention ever and totally worth the investment) and drizzled the caramel and toppings on top. Again, I was too busy eating and socializing to take pictures…so this is the only one I snapped. DOH! Maybe it was the fact that we had 6 adults and 9.5 kids under the age of 6 that were sugared up and running around like crazy…? Regardless of the lack of pictures, I promise it was tasty, and super fun. Again, I believe that more laid back and casual you make it, the more people enjoy themselves! 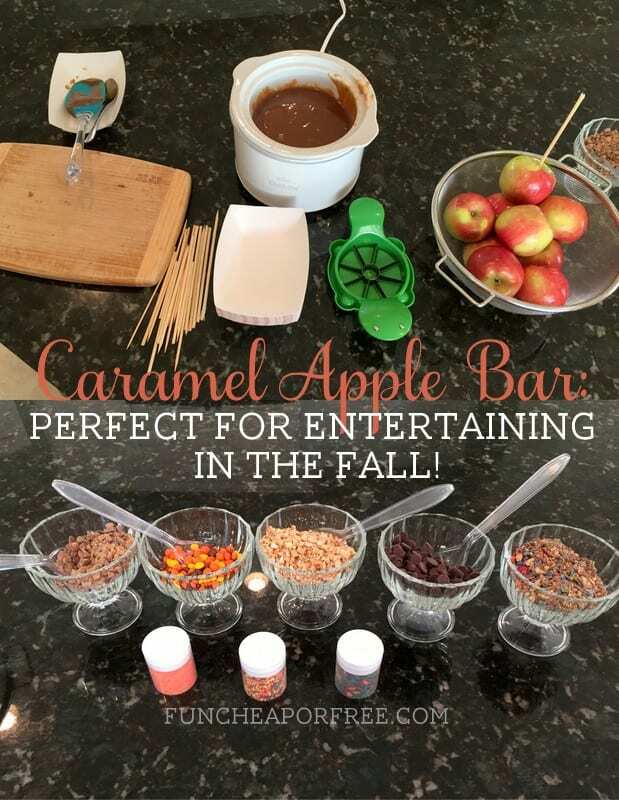 Hope you try it and have a great time caramel apple bar-ing this fall 🙂 Enjoy! From one TS wife to another – MAJOR PROPS for making it through the last 3 months with 3 littles and one of the way. I really feel Great to be here as I don’t know about this amazing caramel apple bar !! Thanks Kari for this useful information to readers like me….. 🙂 !!! !